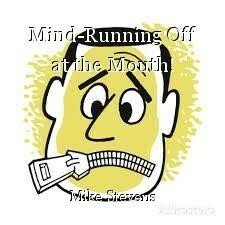 Mind-Running Off at the Mouth! Me no gots da radar! you know, sometimes I just shouldn't even try. But how do you think that works out for me? Do I ever not? and from there, it's 'no, not again!' but it's already too late. that blows--and one who wishes he was on a slow boat to Chiner! Sometimes, we don't think before posting something, other times, we post against our better judgement because it holds enough truth that it may receive positive feedback. There is the odd occasion where it may take more than ten seconds to decide if something should be put out there for everyone to read and see, but most things are posted in the heat of the moment. It can be such a struggle when so strongly passionate about something to decide whether or not to make a comment or write a piece and share it. And these days, it's impossible to reverse that decision once it's on the interweb. Silence can be a better alternative at times. I agree, but sometimes I figure I have a right to my opinion, don't I? But you're right, once it's posted, there's not a lot you can do about it, except delete it, but you can't even do that on some sites, so...I don't know if you've ever done this, but I've posted what I thought was a humorous reply to someone's post, on one which there's no 'delete,' and realized almost immediately that that person would find it offensive, rather than humorous, and it's already too damn late to take it back. That's where I usually get in trouble, posting early in the morning before I've had my coffee, or late at night, when I'm tired, and I don't think it through. I always triple read what I write, the first time to check for spelling and grammar errors (the inner writer never sleeps! lol), the second time to check spelling and context, the third time just to check context. There are a few times, late at night when I shouldn't be posting things, that I sometimes post something that is poorly worded, making it easy for someone to misinterpret what I'm really saying. Fortunately, those sites always have an 'edit' function, so I can fix it. There have been a few times where I've written something that the person could get offended by, but I realize it before I send it. Thankfully. My problem is I get so sick of reading something that I miss obvious things. The more I read something I wrote, the less I see! I'm Justin Sane, not just insane!